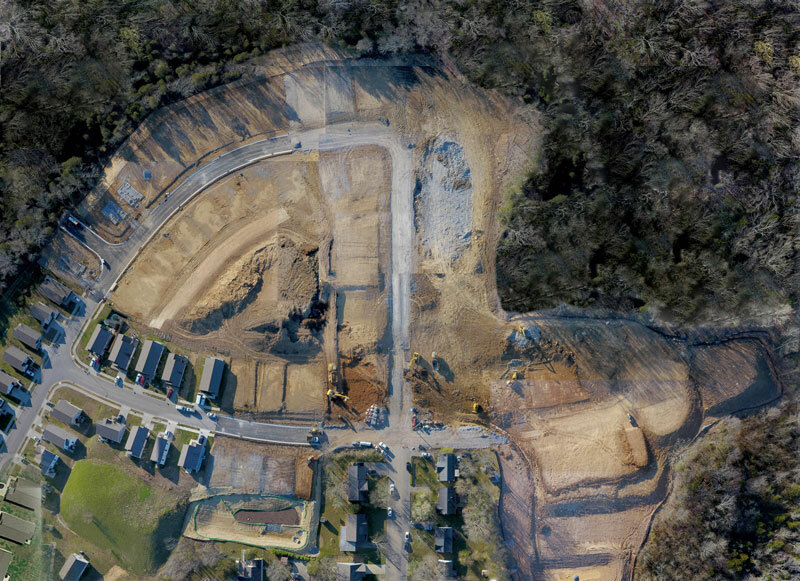 This is an aerial view of the 2019 Jimmy & Rosalynn Carter Work Project site now. In October, hundreds of volunteers, along with the Carters, will be building 20 homes. Individual Volunteer Registration is Closed! Registration for individual volunteer opportunities for the 2019 Jimmy & Rosalynn Carter Work Project is full! A limited amount of corporate volunteer opportunities are still available. For more information about corporate sponsorships, contact Lauren Lane Payne at: llanepayne@habitatnashville.org. We are excited to welcome all of the Carter Work Project volunteers in October and we are planning a very special week. The photo above will look very different by October! Signing up to support the 2019 Jimmy & Rosalynn Carter Work Project in Nashville as a sponsor not only secures volunteer slots and premium seating at events throughout the week, but it also supports a larger initiative to do more about affordable housing for Nashville's workforce. Habitat of Greater Nashville hopes the Carter Work Project will serve as a catalyst to unite many concerned private sector, government and non-profit organizations to find meaningful solutions for our city's workforce housing. For more information about sponsorships, contact Lauren Lane Payne at llanepayne@habitatnashville.org. The Carter Work Project (CWP) week is a great time to not only help 20 hardworking families purchase homes with a 0%APR mortgage (58 families total will be served through CWP funding), but it is also a week to make new friends and be a part of Nashville's historic event hosting the former President and Mrs. Carter. Garth Brooks and Trisha Yearwood, who have supported the CWP the last 10 years, will be on hand to welcome volunteers and make the week special. In addition to building homes all week, it is our intent to celebrate Nashville's wonderful history and music. More details to come. We hope to see you in Nashville in October! 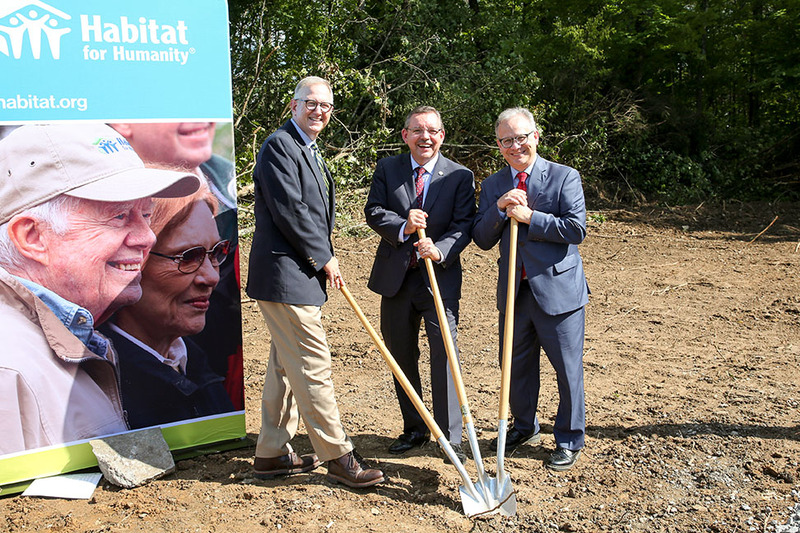 From left, Danny Herron, Ralph Perrey and Mayor David Briley break ground at Park Preserve, the site of the 2019 Carter Work Project. Ralph Perrey, executive director of the Tennessee Housing Development Agency (THDA), announced a $1 million challenge grant in support of Habitat for Humanity’s Jimmy & Rosalynn Carter Work Project. 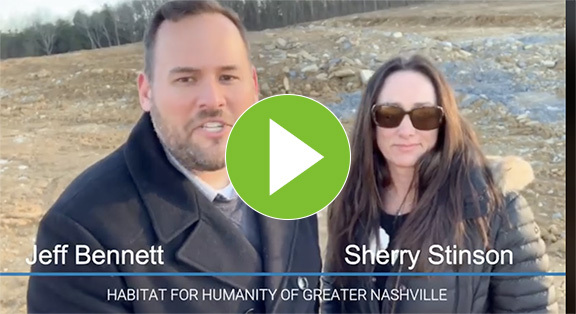 The 2019 Carter Work Project will be hosted by Habitat for Humanity of Greater Nashville in the north Nashville neighborhood of Park Preserve Oct. 6-11, 2019. Perrey issued the challenge grant to kickoff fundraising for the Carter Work Project in Nashville next year. Perrey joined Nashville Mayor David Briley and Habitat of Greater Nashville President and CEO Danny Herron to talk about plans for the upcoming Carter Work Project, its impact on the city of Nashville, and the affordable housing challenges facing our community. According to Herron, sponsorship opportunities for the 2019 Jimmy & Rosalynn Carter Work Project will serve a total of 58 Nashville families. Twenty new single-family homes will be built during the Carter Work Project week in October. An additional 12 new single family homes and 26 new townhomes will be constructed by 2021 with support of funding raised for the project. The 2019 Jimmy & Rosalynn Carter Work Project is coming to Nashville! Nashville has been chosen as the host city for Habitat for Humanity’s 2019 Jimmy & Rosalynn Carter Work Project, Danny Herron, president and CEO of Habitat for Humanity of Greater Nashville, announced. The historic occasion will take place Oct. 6-11, 2019, and the Carters, along with Garth Brooks and Trisha Yearwood and hundreds of volunteers, will spend the week building 20 new homes in partnership with families in the north Nashville neighborhood of Park Preserve. Park Preserve is a 42-acre Habitat developed neighborhood with 93 homes. It will have 175 homes when it is complete. An additional 12 new single family homes and 26 new townhomes will be constructed by 2021 with support of funding raised for the project for a total of 58 families served. Affordable housing is an urgent topic in Nashville. According to the latest Housing Report from the Davidson County Mayor’s office, more than 200,000 people living in Nashville cannot afford the cost of housing. Nashville has lost over 20 percent of its affordable housing since 2000. By 2026, it is projected that Nashville will need an additional 30,000 affordable housing units. The Carter Work Project will increase Habitat of Greater Nashville’s capacity to make a significant impact on affordable housing for years to come, says Herron. 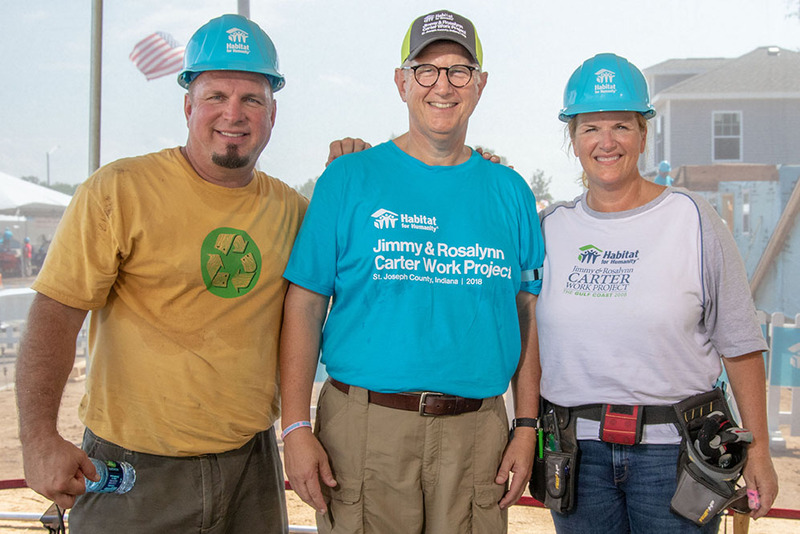 Since 1984, President and Mrs. Carter have been champions and strong voices for affordable housing, donating their time and leadership each year to build and improve homes around the world with Habitat for Humanity. Inspiring millions, more than 100,000 volunteers have worked with the Carters in 14 countries to improve access to affordable housing. Habitat of Greater Nashville and the city of Nashville are thrilled to be a part of this special project. For more information about volunteer opportunities, contact Sherry Stinson at sstinson@habitatnashville.org. For more information about sponsor opportunities, contact Lauren Lane Payne at llanepayne@habitatnashville.org. Eric and Natalie Paslay at the 2018 Carter Work Project in South Bend.